On November 21, 2014, Sangamon County Circuit Court Judge Belz found for the plaintiffs, finding their claims that the pension reforms were unconstitutional had merit and the defense offered by the State, which was premised on police powers of the State allowed the reforms, was inapplicable. The Attorney General, on behalf of the State, sought an expedited appeal of the circuit court ruling, which was granted. Oral arguments before the Illinois Supreme Court were heard on March 11th. The State’s argument on appeal was premised on a belief that, notwithstanding a possible violation of the Constitution’s pension clause, the State’s reserved sovereign powers, namely the police power to ensure the health, safety and welfare of its citizens, permitted the pension benefit reforms to be made. The Illinois Supreme Court ruling found P.A. 98-599 unconstitutional and permanently enjoined its enforcement. Regardless of the severability provision that linked only certain reforms, written to allow some reforms to fall and others to stand if so ruled by the Court, the opinion held that the pension annuity reduction provisions were so central to the Act that the entire Act must fall. The Court found that if all unconstitutional provisions were stricken, then the bill would no longer reflect the intent of the General Assembly and must be void in its entirety. House Republicans reject piecemeal budget components. 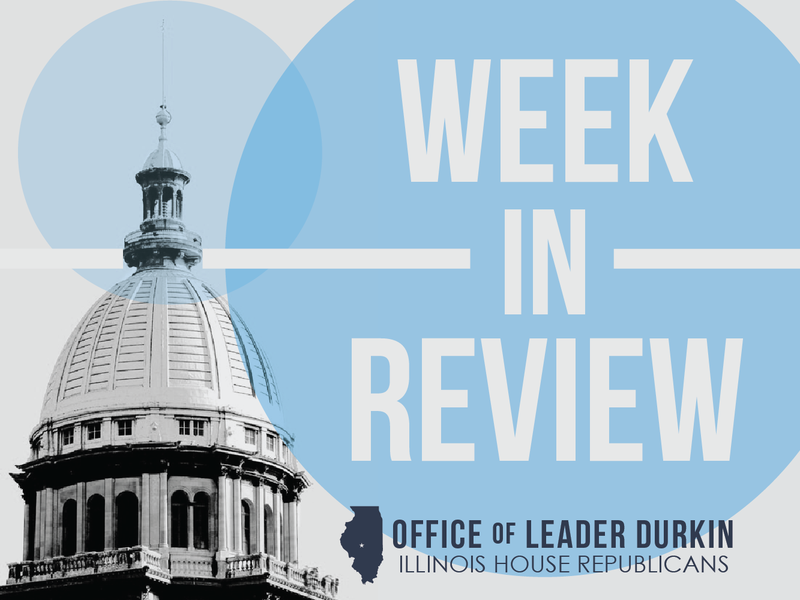 An all-too-often told story played out again Wednesday in the Illinois House of Representatives: the story of a broken, backwards budgeting process intended to divide, not unite. The process began with Governor Rauner’s introduced Fiscal Year 2016 budget which is meant to be a starting point for negotiations through which changes are made, with a final budget arriving back on the Governor’s desk for either approval or rejection. The budget process is designed to ensure all priorities are considered and more important that all decisions are made in an open and transparent manner. While the Democrats continue to play budget games, they cannot hide from the fact that they are responsible for Illinois’ budget woes. Democrats had twelve years of absolute control of Illinois state government. During that time, they passed unbalanced budget after unbalanced budget. Democrats over-spent, over-borrowed and over-taxed, driving jobs and tax dollars out of Illinois. House Republicans call for benefit certainty, process reform. A lengthy Committee of the Whole hearing on workers’ compensation issues was held before the full House on Tuesday, May 5. 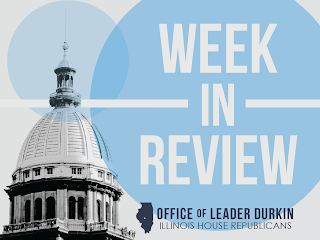 Injured workers, members of their families, and other stakeholders testified to lawmakers on the strengths and problems of Illinois’ current system of workers’ compensation. House Republicans pointed out that many agree that benefit levels to workers should not be changed and there are substantial savings in prospect from reforms to the workers’ compensation process. Existing pieces of the Illinois workers’ compensation process, including the standard of causation used to reach a definitive determination of what caused a workers’ injury, can be looked at to bring these standards into line with the standard practices of most other U.S. states. As one benefit of these changes, reforms to the process could reduce fraud and speed up the determination of cause of a workers’ injury. This could lead to faster compensations getting paid to injured workers. Despite limited workers’ compensation reforms passed in 2011, Illinois still has the seventh highest workers’ compensation costs in the country. These high structural costs drive jobs to other states, including Indiana, where workers’ compensation costs are more than 50 percent less. For every $100 in payroll an Illinois employer pays another $2.35 in workers’ compensation premiums, whereas Indiana employers pay $1.06. For 2014, Illinois’ rates are 27 percent higher than the national median. Governor Rauner speaks to Chicago City Council, warns no bailout. As the fiscal picture darkens for Illinois’ largest city, some advocates have held out hope that Illinois taxpayer could be persuaded to ride to the rescue with moves intended to bail out Chicago. However, in remarks delivered to the Chicago City Council on Wednesday, May 6, Governor Rauner told Chicago’s mayor and alderman their city has many strengths. The governor asserted that leveraging these strengths, combined with sacrifices by stakeholders, will lead to city-state cooperation that offers the best hope of achieving financial recovery. “Compromise,” the governor urged. “Accept things we might normally oppose. That’s going to be required of all of us.” Chicago issues in which State actions are possible include pension reform, a possible Chicago-based casino, school reform, and changes to labor-management law. Bond rating agencies agree that the quality of Chicago’s debt is plunging towards junk-bond levels. Governor Rauner releases key findings from Illinois-initiated study of ten foreign trading partners. The survey of key Illinois investors shows areas where Illinois can improve in its ability to become a focus for job creation and economic growth. Foreign companies considering investment in Illinois are asking the State and its lawmakers to focus on the State’s high tax rates, aging infrastructure, and lack of vocational training. The nations surveyed here have invested tens of billions of dollars in the United States, leading to the employment of hundreds of thousands of Illinois workers. University of Illinois CFO asks that university decouple from State’s credit rating. The U of I’s chief financial officer, Walter Knorr, briefed university trustees on Thursday, May 7. He reported that the University’s capital image is currently underperforming its AA rating, and attributed this underperformance to a belief by investors that Illinois’s negative credit outlook is creating a parallel negative outlook for U of I credit. Knorr told the trustees that he has begun discussions with Moody’s Investors Service, the nation’s largest credit-rating agency, on decoupling the two ratings. Other Illinois state universities have also faced falling credit ratings in recent months, with cuts posted for Eastern Illinois University, Illinois State University, Northeastern Illinois University, Southern Illinois University, and Western Illinois University in calendar year 2014. Governor names new executive inspector general. Maggie Hickey, a professional federal prosecutor, is finishing up a 10-year tour of duty in the Office of the Northern District of Illinois. She was named by Gov. Bruce Rauner on Tuesday, May 5 to the key post of executive inspector general. The Office of the Executive Inspector General is a position created by the State Officials and Employees Ethics Act. Hickey will serve as a permanent, in-house monitor of activities in Illinois’ executive branch. Illinois’ executive branch includes more than 350 separate agencies, boards, and commissions. The Office of the Executive Inspector General monitors ethics complaints against employees and supervisors in each of these agencies, and cooperates with the Executive Ethics Commission to adjudicate action on these complaints. Almost-operational medical cannabis system could get right to sell to patients with PTSD, migraines. Under Illinois law, entry into cannabis dispensaries is limited to patients with cannabis cards that signal a specific recommendation by an independent medical care provider that they be allowed to buy and consume the controlled substance. More than 2,000 cards have been issued, with an additional 700 applications currently in the pipeline. The State and its courts continue to work on remaining legal snarls that have delayed opening of the first dispensaries. A key control point in the Illinois cannabis system is the limited right, created under law, of a licensed medical physician to recommend that a patient receive a medical cannabis card. Physicians are only allowed to initiate this recommendation if they have an established medical relationship with a patient who has presented with a limited number of eligible diagnoses. Diagnoses that will allow a medical physician to recommend a patient for medical cannabis include cancer and multiple sclerosis. Action taken by a key advisory panel within the Illinois Department of Public Health could expand this list of diagnoses. The panel asked IDPH to adopt an administrative rulemaking to add irritable bowel syndrome, chronic migraines, diabetic neuropathy, peripheral neuropathy, osteoarthritis, and PTSD to the list of qualifying conditions. No action will be taken by physicians with respect to these diagnoses until the Department of Public Health adopts rules in line with this recommendation. The panel found that non-definitive research indicates that significant compounds within marijuana, CBD and THC, could be helpful in reducing anxiety, hyperarousal and other symptoms associated with PTSD. PTSD is one of several mental-health-related conditions that are characterized by disappointing results for some patients when they are prescribed existing pharmaceutical treatments approved by the federal government. Illinois House observes Peace Officers Memorial Day. The annual ceremony honors peace officers who have been killed in the line of duty. The 2015 memorial observance was held at the State Capitol in Springfield on Thursday, May 7. In remarks regarding the Memorial Day and ceremony, Illinois House members with police experience spoke out about their feelings of gratitude toward their fellow officers while carrying out their duties. Representatives John Anthony, John Cabello and Brian Stewart were among the observers. Newly-appointed State Fair Director looks forward to return to farm themes. Patrick Buchen, the director of the state fairs held each summer in Du Quoin and Springfield, Illinois, called for the two fairs to renew their historic identities as promoters of Illinois agriculture. The fairs include events in which competitors submit live animals and a variety of agricultural products and crafts for judging. Many of the entrants are Illinois young people. Announcing its 2015 theme, “Growing Illinois,” the State Fair and its new director thickened the status of plans for their annual festivals. The Illinois State Fair in Springfield, with its 162-year-long history, will be held on August 13 through August 23. The DuQuoin Fair, which has been held for 92 years in Southern Illinois, will be celebrated on August 28 through September 7. Music, carnival rides, ballroom events, and festival food will be enjoyed at both fairs.